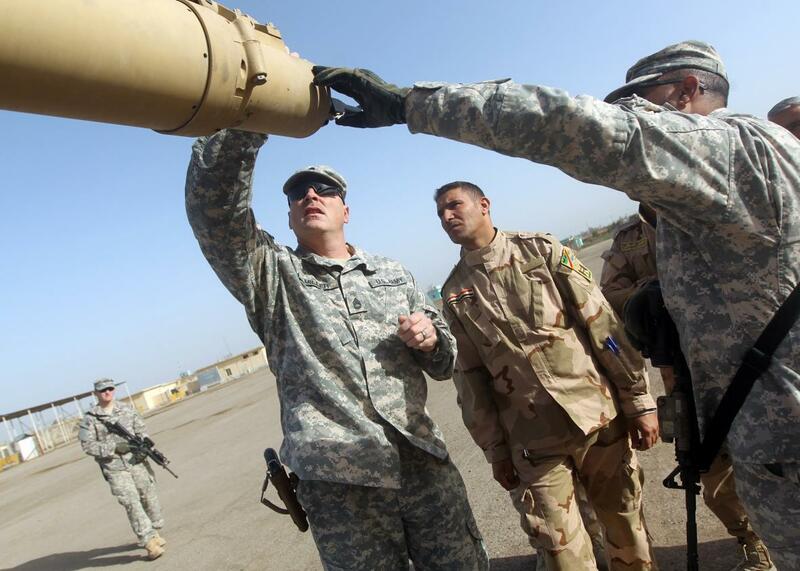 American and Iraqi military trainers shows Iraqi soldiers how to check the barrel of a tank at the Taji base complex, which hosts Iraqi and US troops and is located north of the capital Baghdad, on January 7, 2015. In the days following the Special Forces raid in Iraq last week in which a U.S. soldier was killed, the Pentagon insisted that the raid—the first time U.S. ground forces had fought alongside Kurdish forces against ISIS—was a “unique circumstance” and not “something that’s going to now happen on a regular basis.” Above all, they insisted that U.S. ground forces were “not in an active combat mission” in Iraq or Syria. That line lasted about a week. All of this is now plainly untrue. The American-backed rebel force in Syria is a tiny fraction of what it was supposed to be, it looks more likely than ever that Assad will be in power, and U.S. troops will continue to be dispatched to fight ISIS on the ground. The operation certainly still differs from the Bush-era wars Obama compares it to in its size and the amount of risk to American soldiers. But it shares with them a tendency toward mission creep and ever-shifting goals and tactics.